You and your family can join the rest of us this year. The Thanksgiving Reader is something we can all do together, transforming our holiday into something even more memorable. Download the file, print it out and become part of it. It’s free. The best holiday of the year. 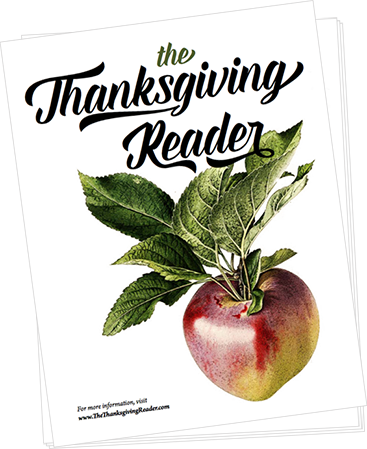 The Thanksgiving Reader is a print PDF. * If you're seeing this on your laptop, just make your web browser window bigger and you'll get the download button instead. The Thanksgiving Reader was created by Seth Godin. Creative Direction: Alex Peck. Special thanks to Casper ter Kuile, Chelsea Shukov, Gretchen Rubin, Susan Piver, Dan Pink, Pamela Slim, Anne Marie Miller, Niki Papadopoulos, Arianna Huffington, Kevin Kelly, Anne Kreamer, Brian Koppelman, Liz Danzico, Debbie Millman, Emily McGuire, Willie Jackson, Wes Kao and you & your family.